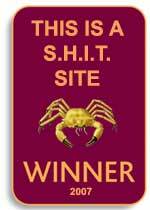 Head Rambles is delighted to announce the Golden Crabs Awards [previously known as the Golden S.H.I.T. Awards. For some years now, there has been an award known as the Golden Spiders. To obtain one of these awards is very difficult, and it is therefore perceived as being the de facto award system in Ireland. However, the reasons behind the difficulty are simple. You have to pay a considerable entrance fee just to be considered. Voting is done in a secret and apparently arbitrary manner. Winners invariably have some connection with sponsors. The sites that have won to date, are in the main, run of the mill sites, showing no exceptional qualities whatsoever. In fact, most even fail to meet the basic criteria of coding. Here, at Silver Haired Internet Technology, we feel that any site should be eligible to enter regardless of financial backing. Sites that qualify are any site that is on the Internet. I know this is a bit restrictive, but we have to keep the numbers down a bit. Do you like a site because of its design or content? Is it easy or hard to navigate? Do you love it or hate it? This is a versatile award and may be given for the best, or the worst. So it is up to you to nominate the sites, and send them their awards. Encourage them to pass on the voting. If they want to know what it’s all about, just send them here. Here is the nice bit. There are no categories or criteria. You set them yourselves. So you can nominate a site as being the best blog, or the worst blog, or the blog you most visit on a Tuesday. You decide. In the spirit of the Awards, the recipient should declare what they received the award for though. Let us all see what we think of each others sites. There are a couple of logos to send on as awards. I’ll throw in a couple of copies of Microsoft Office 4.3 as bonus prizes. I found them cleaning up the other day. The winners must have a floppy disk drive though because each copy comes on 34 floppy disks. a) making it virtually impossible to locate anything in it’s archive. By removing the simple calendar they used have they managed to take navigability to an all time low. b) still having a dedicated section on Election 2007. It’s long over folks. c) trying to wreck my head with fekin popups. Don’t they know we block them? d) having begun a blogs section. Fek off lads, that’s our job. Thanks Robert. Much appreciated. I might have a copy of DOS 2.1 lying around somewhere too. Sneezy – Just write to ’em and tell them they’ve won! I could donate an Abacus…. but wait now it might be worth a few pence. Grannymar – Hold onto the abacus. Calculators are only a passing fad. When is Ron back from his travels? I need him to look at my site. Technorati spiders can’t find it and Irish Blogs find the odd page about three months after its posted – I think I must have something wrong. I think my punters might take exception to a Silver Haired logo on my page!